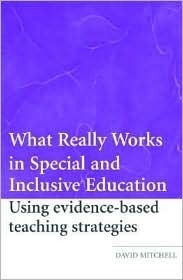 Handig en overzichtelijk boek met interventies die effectief blijken te zijn in het speciaal onderwijs. Je kunt het boek goed in delen lezen. I didn't read this book cover to cover, but I read a good majority of it for class.Though I borrowed in on short loan from the library I was tempted to buy it because it had so many great ideas in it!I am not going into primary education, but I think it is a must read for any teacher. David R. Mitchell - Dr David Mitchell is an Adjunct Professor at the College of Education, University of Canterbury, Christchurch.